Skylark Drone Research – Dr. Tulinda Deegan Larsen Up in the Air and Flying High! Staying with our “seniors” theme for August we thought it appropriate to write about the youngest 64-year-old we know…Dr. Tulinda Deegan Larsen. I am lucky to know Tulinda personally as she is married to one of my best friends, Carl Larsen, who is also Tulinda’s official drone catcher! And that is the subject of this article…the ability to remake ourselves. Dr. Larsen is the Founder and CEO of Skylark Drone Research and just launched her first book…Six-Word Lessons For The Drone Hobbyist. A new life…yes, but it took the first life to get here. I first met Carl in the late 70’s and we became good friends. After a few years Carl reunited with high school classmate Tulinda and they got married in 1982. While Carl was teaching me to sail in the early 80’s Tulinda was putting her economics degree to use when she became staff economist for the US Department of Transportation; Director, Vice President Regional Airline Association and President of Alaskan Air Carriers Association all while also getting her certification as a single engine pilot in Alaska. After marrying, the couple moved to Sea Cliff, Long Island where they raised their two children, Bryce and Jenny. Time was spent with the kids and their 41-foot Catalina Morgan Classic sailboat. Life was good and Tulinda continued her “rise” in the Aviation field. They had also moved their boat to Kent Island in Maryland on the Chesapeake to extend their sailing year in a warmer climate. After Bryce and Jenny had graduated from college, Carl changed jobs and the couple moved to Annapolis where Carl took a position at Anne Arundel Medical Center. While trying to decide where to live the couple temporarily moved on to White Fin, their sailboat. Soon they decided that they would embrace the live-aboard lifestyle and established White Fin as their legal residence. This was January first, 2008…one of the coldest months on record. The experience is worth a short story! While living on White Fin, Dr. Larsen continued her education and received a Doctorate of Management from the University of Maryland University College. In 2009 Dr. Larsen founded her company, Skylark Services, LLC, and was certified as a Women’s Business Enterprise (WBE) by the Women Presidents’ Educational Organization, a regional partner organization of the Women’s Business Enterprise National Council (WBENC). From 2012 through 2015, she applied her dissertation research into improving airline operational performance to the start-up company masFlight, the cloud-based aviation data warehouse and big data analytic platform. masFlight was acquired by Global Eagle Entertainment in August 2015. Dr Larsen worked on the transition of masFlight to Global Eagle and on the development of connected aircraft analysis and research services for several transportation companies. As it happens to most live aboard sailors, sooner or later you get a power boat. 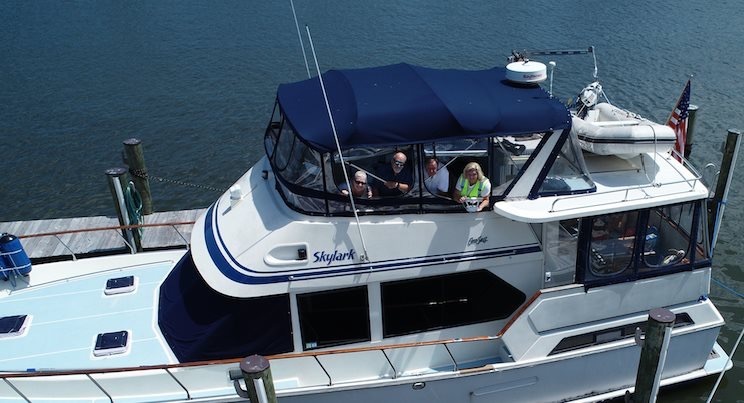 In 2013 the Larsen’s attended the Trawler Fest in Baltimore and bought Skylark – an Overseas PT 46, 48- foot trawler – and moved aboard. In 2016, Dr. Larsen became interested in drones and began to understand their commercial potential. 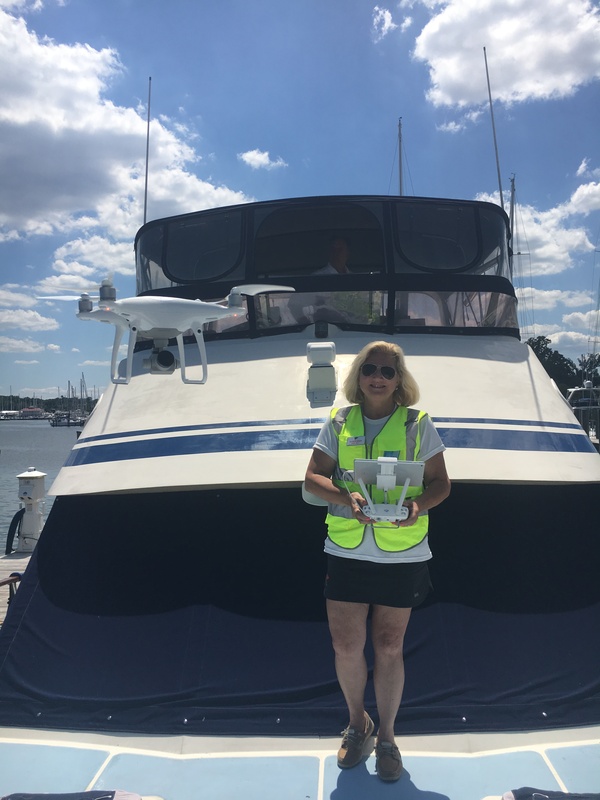 She earned her FAA Drone Pilots License and began to film sailboat races from the air. She formed Skylark Drone Research that same year and since then the sky has been the limit. 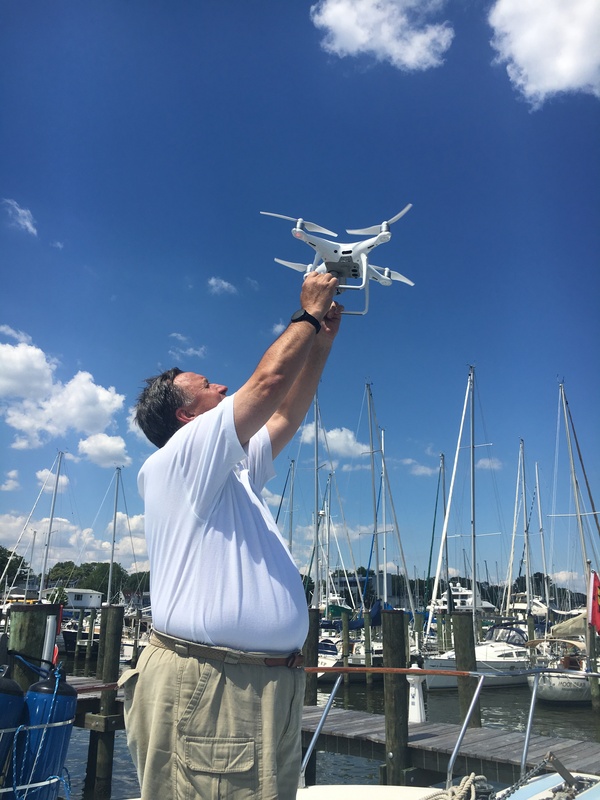 In February of this year, Dr. Larsen contributed to a Gowrie Safety Report on how to use drones for your sailing organization and the related laws and regulations can be confusing even to those in the industry. “Market growth and usage is expanding for Unmanned Aerial Vehicles (UAV’s), also known as drones. 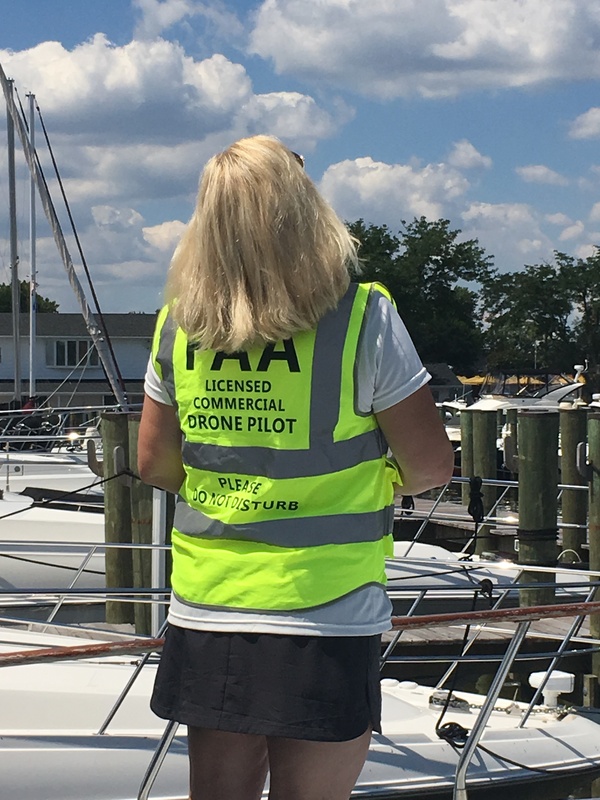 At the end of 2017, which marks two years since drone registration began, there were more than 1 million drones registered with the Federal Aviation Administration (FAA),” she writes. “For perspective there are only 250,000 registered manned aircraft, and it has taken more than 100 years to reach that number. The FAA projects that by 2020 there will be 7 million registered drones, with 442,000 commercial drones. The market research company Gartner estimates that in 2017 more than 3 million drones were manufactured globally, marking a 39% increase over 2016.” Being a sailor myself, I found the information about drone usage in the marine and sailing industry interesting. 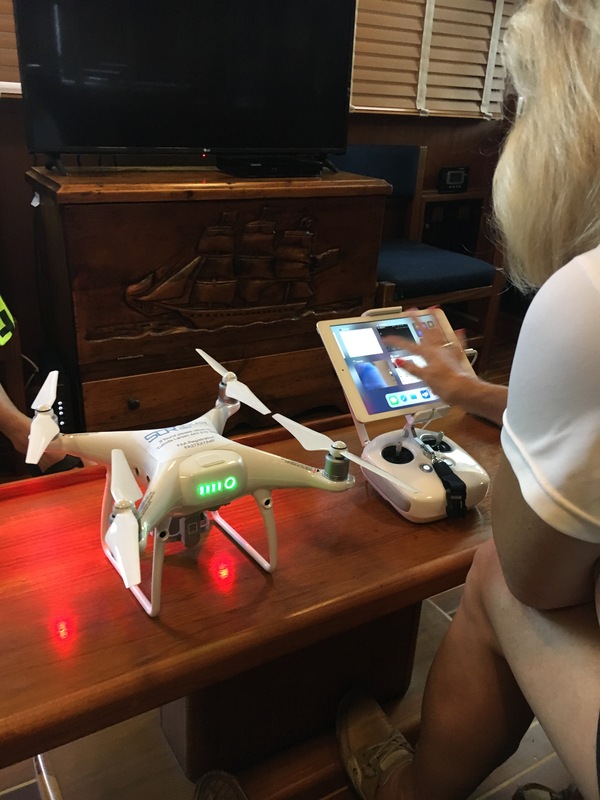 “There is Impressive and spectacular drone footage online from the Volvo Ocean Race, the Americas Cup, and one Design Racing captivates and amazes viewers worldwide,” she tells me. In the future, local jurisdictions will be responsible for tracking drones. Dr. Larsen is part of a group that is building a protype of a Command and Control Operations Center in Tooele, Utah. Operation of drones are mostly based on visual line of sight or VLOS, which is .8 miles. In the future the three key variables to be worked beyond VLOS is communication, navigation and surveillance. The Command and Control Center will help in this development. The second time around is not only dedicated to Dr. Larsen’s work, but also to her children and grandchildren. They love skiing, where husband Carl is still active with the ski patrol at Bryce mountain resort and ski trips to Utah where their daughter Jenny and her husband Adam live, who are both avid skiers. For someone who will turn 64 this month, Tulinda, Dr. Larsen has accomplished a lot. But when you consider that she earned her doctorate degree between the ages of 54 and 59, had her own business and sold it, and now is doing it again is amazing. Maybe 64 is not the new 40, but don’t tell that to Dr. Tulinda Deegan Larsen.